The Tusk Modular UTV Pack is an excellent storage pack capable of carrying large loads of cargo and fits nicely in the bed of your UTV. With semi-rigid walls and internal divider, the storage pack operates like a soft box. To add to its versatility, the Tusk storage pack is also split into three separate components. The center pack is the largest and serves as an excellent soft storage box on its own. The smaller side packs offer additional storage room and have the ability to completely detach from the center module, allowing you to make adjustments on a ride-by-ride basis depending on your storage needs. There aren't many soft storage boxes that offer the value that Tusk does. When you think of quality UTV or side-by-side parts, think of Tusk! 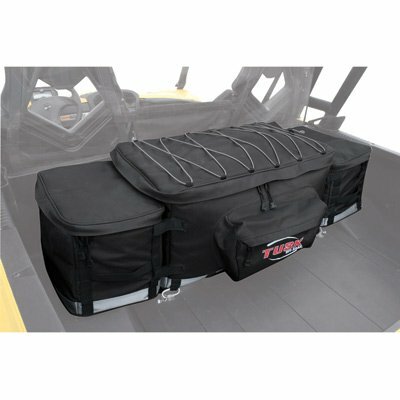 The Tusk Modular UTV Pack is a large storage pack that is capable of carrying loads of cargo and fits in the bed of your UTV.The storage pack is constructed with durable 600 denier polyester with heavy-duty zippers and nylon-webbing mounting straps and handles. The center pack measures 15"x25"x12".The side pack are 8"x13"x10" insulated coolers that easily attach to the main pack, offering expansive and versatile storage options. The Tusk Modular UTV Pack features a water-resistant liner to conveniently store drinks and food. The main center compartment features semi-rigid walls (serving like a soft box) with a felt soft liner and a removable divider to adjust to your cargo. The rear zippered pocket adds additional storage with easy access.The Tusk storage pack includes a mounting kit.